It was confirmed at the beginning of August that the Horag Lola would be heading to North America in September, for Petit Le Mans and Laguna Seca. Didier Theys reaffirmed that intention two weeks ago, to dsc, although we didn't re-state that fact - but can now add that Eric van de Poele is the third driver in the B05/40 for Petit Le Mans, joining Theys and Fredy Lienhard. "I am very excited to be back in the ALMS. I just hope we do more than 250 metres ... remember 2005!" says the Spa 24 Hours winner. This is a reference to the accident involving one of the Aston Martins, as van de Poele in the Lola reached Turn 3 on the car's first out lap, in testing at Road Atlanta last September. van de Poele has a special place in ALMS history, as he and Mimmo Schiattarella won the April 1999 race at Road Atlanta, in the Rafanelli Riley & Scott. Second that day was none othr than Didier Theys, partnering Mauro Baldi in the Doran Ferrari 333, with Dyson Racing third. 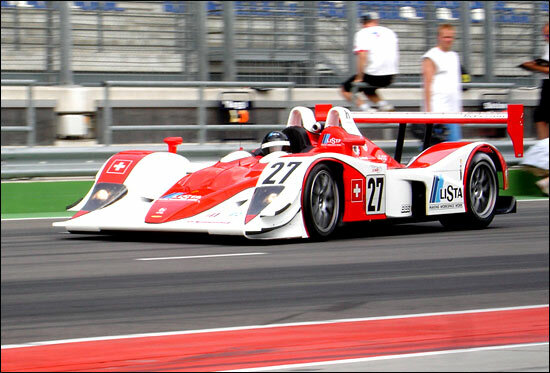 Here's the Horag Lola in testing at the Lausitzring at the end of July.